Although the majority of the books we have discovered over the years and now treasure were published in the UK, there have always been some (from the US or from Europe, say) that have caught our attention and have made sure that the rule was broken. 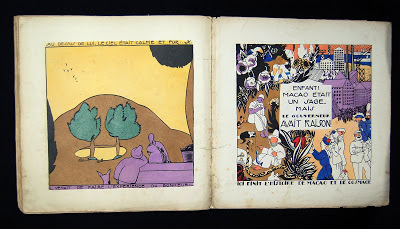 One such is Macao et Cosmage which I have long thought one of the most special and entirely delightful books that we have come across. 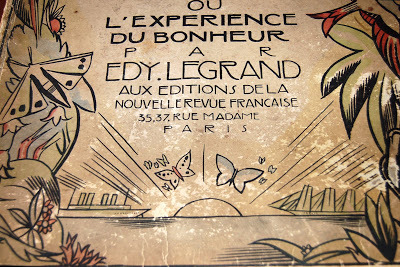 Edy Legrand, who wrote and illustrated the book, enjoyed a long and full career as an artist and illustrator but this book, published in 1919 (when Legrand was hardly out of his teens) seems to me to be a simply staggering achievement. Consulting Google to find his birthdate (1892), I find that I am by no means alone in my admiration! Lower down this post, I shamelessly steal the description of the book from one bookseller and, having taken photos of lots of pages to share with you, the first thing I come upon is a site where one devotee has posted THE ENTIRE BOOK! 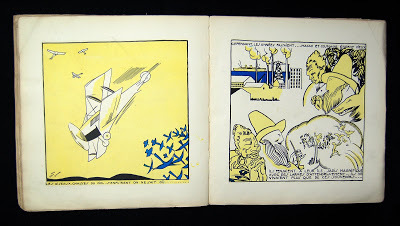 Everything about the book is joyous but it is the style of drawing and, above all, the colour that raise it to such a high level – for what was apparently a cheap childrens’ book. Much of the colour printing at that time was pretty pale and insipid so this must have been a great excitement. 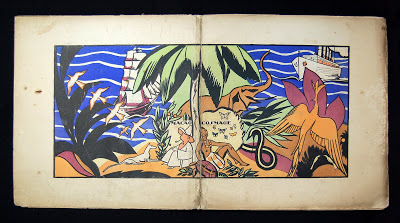 In case any readers are unfamiliar with the word ‘pochoir’, this was a colouring method where any number of colours were added to a black (or whatever) printed base BY HAND, using watercolour-charged brushes guided by stencils usually cut by the artist. 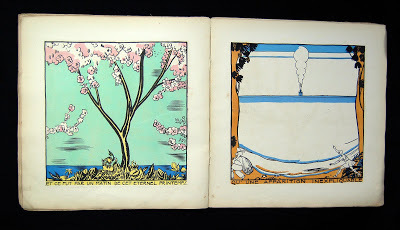 The technique enjoyed various high points through the 20th century and is still occasionally used nowadays but usually (in my jaundiced opinion) in a pale, safe and decorative way which is nothing like the glory to be found on the pages in Macao and Cosmage! DO, by the way, click on the pages to enlarge. 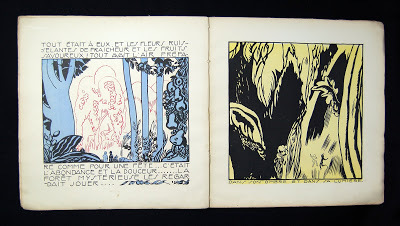 You can see the images better and, especially, the wonderful hand lettering. 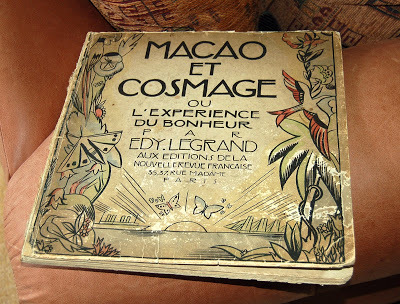 Macao et Cosmage ou L’Experience de Bonheur. 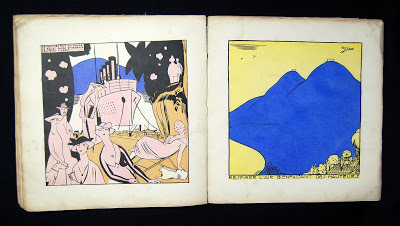 Square folio, pictorial boards coloured by pochoir. [54 pp. (including pastedowns).] 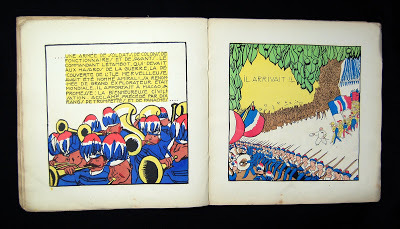 Each page extravagantly illustrated and coloured by pochoir.